I've made a lot of muffin recipes for this blog. I've also made a lot of nut butter based muffins. I'm going to make a bold statement: These are my best muffins yet. I was going to make another batch of my Whole Wheat Peanut Butter Muffins, but I happened to find one frozen banana that was kicking around, so I figured I could incorporate it somehow. When I make a new muffin recipe, I generally just keep adding stuff until I get the right balance of wet to dry ingredients, then I mix them together. I ended up adding unsweetened applesauce gradually until I got the right amount (since I only had one banana). If you have two or three bananas, adjust the amount of applesauce by volume, or eliminate it altogether. I love peanut butter. When I'm baking, I'd rather avoid the added sugars of traditional peanut butter, but I am not a big fan of the texture of natural peanut butter. For me, the happy medium is Kraft Unsweetened Unsalted peanut butter (the blue label). This product maintains the texture of traditional smooth Kraft peanut butter, but doesn't have the added sugars or the problem of the oil separating. 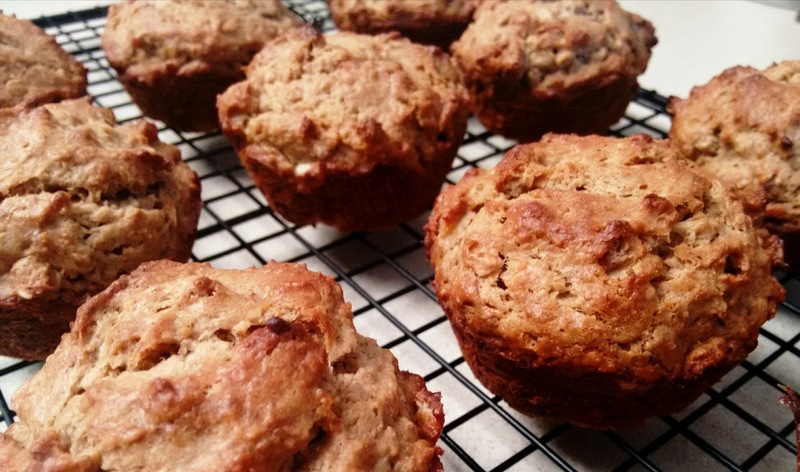 Nut butter muffins tend to run higher on the caloric spectrum (as far as muffins go), so these might seem a little high, but the macronutrient content is pretty similar to a Clif Bar. In fact, these muffins have less than half the sugar content of a Clif bar! Preheat oven to 350°F. Line a muffin tin with liners and set aside. In a large mixing bowl, combine flour, oats, baking soda, baking powder, cinnamon and salt. Mix until uniform. In a second bowl, mash the banana with a fork. Add coconut oil and mash it into the banana. Add brown sugar, mash with fork. Add peanut butter, mash with fork. Add vanilla extract, eggs and applesauce and stir until uniform. Pour the wet ingredients into the dry and mix just enough to combine, being careful not to overmix batter. Scoop batter evenly into muffin liners. Bake for 18 minutes, or until muffins are lightly browned.